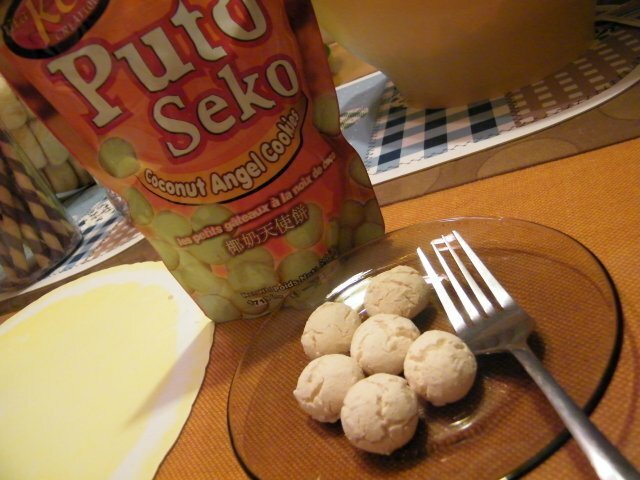 I was delighted to see packs of Puto Seko at the Filipino Store this afternoon. I'm currently savouring this; it's been years since I've had Puto Seko! In the Philippines, it is usually sold alongside local delicacies. The Puto Seko I know is shaped like a small flower and wrapped into a cylindrical shape with white paper. These cookies are quite crumbly and powdery. Make sure you have some liquid on hand while eating this. It's quite irresistible though! The pack I bought is in circular, bite-size pieces (see above photo, fork included for size comparison). I don't think this will last a couple of days with me!